This weekend, the Core Team motored up to the Finger Lakes in our brand new Subaru Outback to see Seth and Christine. Christine’s family has a camp on one of the lakes. Although most of the Finger Lakes have odd names, Skaneateles must be the strangest one. The name Skaneateles, pronounced “skinny atlas,” is derived from the Native American word Skan-e-a-dice, which means “long lake.” At 350 feet deep, it is the third deepest Finger Lake and serves a watershed of seventy-three square miles. It’s also impossible to spell. This probably wasn’t the most propitious weekend for a trip to the lake, since the temperature vacillated between a balmy 70° and a frosty 40°. Fortunately, the region has much more to offer than swimming, boating, and ice cream. We did a little antiquing, a bit of wine tasting, and some culinary experimenting at the Fox Run Garlic Festival in nearby Penn Yan. The highlight of a trip to the Finger Lakes, however, has to be, at least from a birding perspective, a visit to Montezuma NWR. Montezuma is located at the north end of Cayuga Lake. It is a phenomenal place to spot various waterfowl and raptors. The main road is a self-guided observation trail, so one has the convenience of driving from one viewing spot to the next. This is for the best, since a scope is critical in a marsh complex of this complexity. We visited here last year and were pleased to see that many of the same birds dominate the habitat. I’ve never seen so many Common Moorhen and American Coot, extended families with chicks, juveniles, and adults. Herons and egrets also do quite well for themselves here. We saw Great Blue Heron, Green Heron, and Great Egret, with reports of several other species close by. 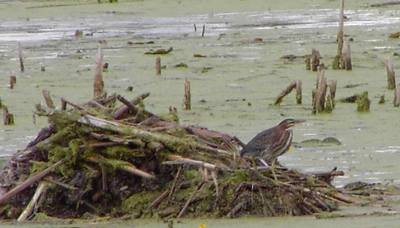 Another wonderful wader in the area was Mr. Thunderpumper himself, the American Bittern, perched on a muskrat mound. On and around these mounds, we saw plenty of Pied-billed Grebe, Wood Duck, American Black Duck, American Wigeon, Northern Pintail, Canada Goose, and Double-crested Cormorant. Raptors thrive in Montezuma. We saw both immature and adult Bald Eagle, as well as Osprey, Northern Harrier, and Red-tailed Hawk. It’s no wonder that these birds flock to the banks of the canal that runs through the refuge. Carp (Cyrinus carpio) run thick in these waters. While this invasive Asian species has been known to top 4.5 feet and 80 pounds, the typical carp is between 1-2 feet long and weighs between 2 to 10 pounds — more than a meal for a hungry eagle. When the water level of the marshy Main Pool is higher than the canal, a veritable riot ensues, as captured in one of our photos above. 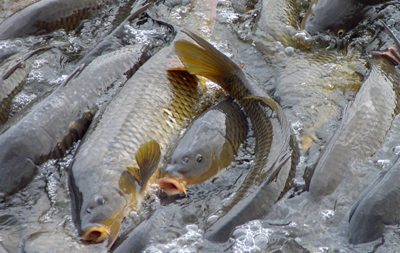 Carp in the Canal want access to the warm, nutrient-rich waters of the Main Pool. However, the carp are barred from the pool because they stir up silt, which reduces sunlight penetration and prevents plant growth. Instead, they teem in the hundreds at the gate separating them from the Main Pool, desperately but uselessly trying to swim upstream. The sight of them is as incredible as the smell is hideous. When water levels subside and water stops flowing from the Main Pool, the carp disperse. The marsh is visited by a variety of passerines. We spotted our very first Marsh Wren lurking in the reeds. We also saw our first Common Yellowthroat of the year, as well as lots of American Goldfinch, Cedar Waxwing, and Eastern Kingbird. Of course, the ponds also were thick with Belted Kingfisher and a variety of swallows and sparrows. Only one pond on the Wildlife Drive is suitable for shorebirds, but it manages to cram in enough species diversity for an entire beach. At the very least, the pond held Killdeer, Lesser Yellowlegs, Short-billed Dowitcher, Least Sandpiper, Semipalmated Sandpiper, and Pectoral Sandpiper, the last of which is a life bird for us. We have no confidence in our own ability to identify peeps, but fortunately, more knowledgeable birders were on the scene. We are always grateful for the input of experts. The shorebirds were joined by lots of geese, gulls, and Caspian Tern. Montezuma NWR is a world-class birding habitat, as good as any other National Wildlife Refuge we’ve visited. Most striking is the consistency of the resident species. If you’re up in the Finger Lakes area looking for good birding, be sure to make it Montezuma.